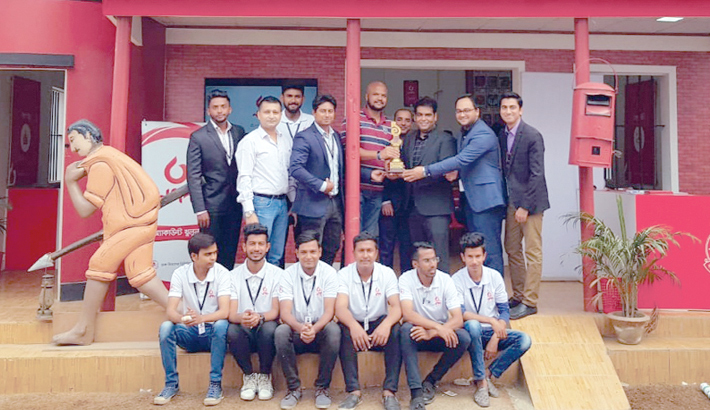 Digital financial service – Nagad has been recognized at Dhaka International Trade Fair wrapped up in the capital recently. Nagad is the latest technology-based platform of Bangladesh Post Office to provide financial service using its existing infrastructure. The mini pavilion of the DFS provider is selected as ‘Best Reserved Mini Pavilion’ at the 24th edition of the mega business carnival. Nagad Managing Director Tanvir A Mishuk received the award from Commerce Minister Tipu Munshi at the closing ceremony of the trade fair. The ‘Nagad’ pavilion had been designed considering the hundred year’s heritage of postal department. The entire pavilion resembled a classic post-box and there is a walking dummy of a postman in front of the pavilion. In fact, people received most updated digital services inside the pavilion designed following classic theme.